Every January I get the urge to make granola. 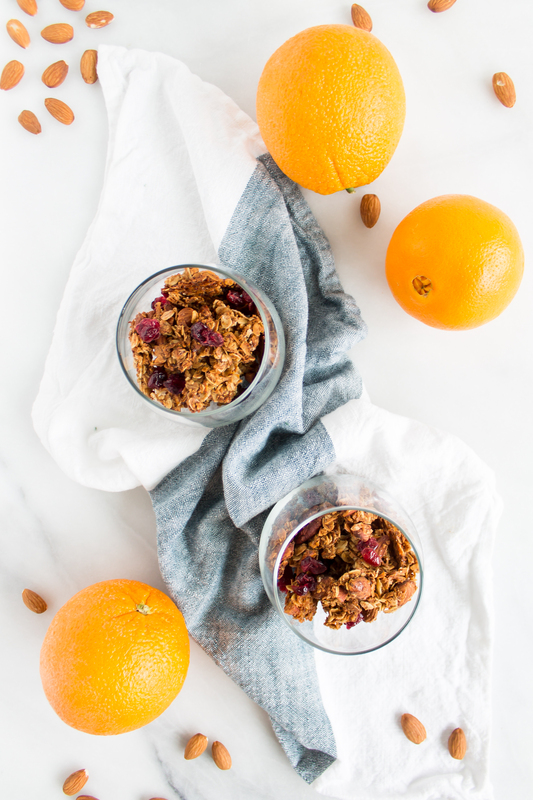 Once the new year hits, I want a fairly healthy breakfast and snack that I can take on the go, combining my renewed ambitions to amp up my time management skills and make healthy choices. The only problem is that I love it so much that I end up eating half of the batch in one sitting, which kind of defeats the purpose. 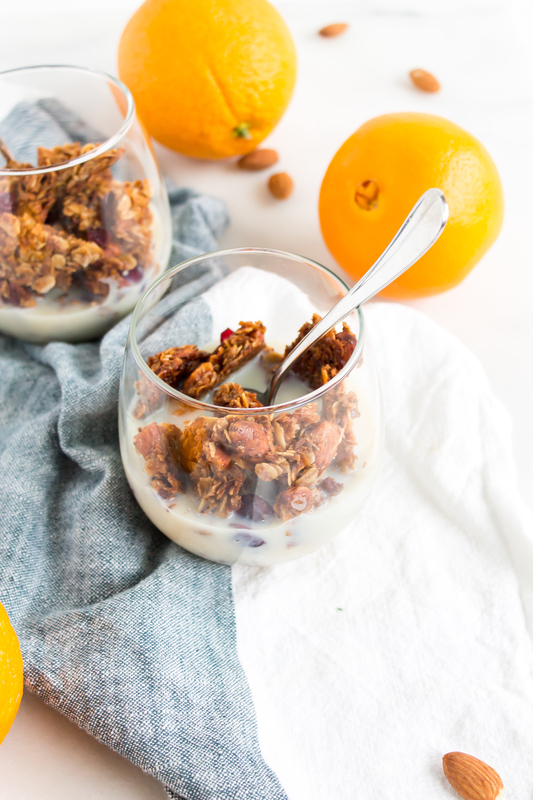 With the classic winter citrus flavor and a hint of almond, this orange almond granola is my new favorite version. When I make granola I always strive for large chunks filled with lots of texture. 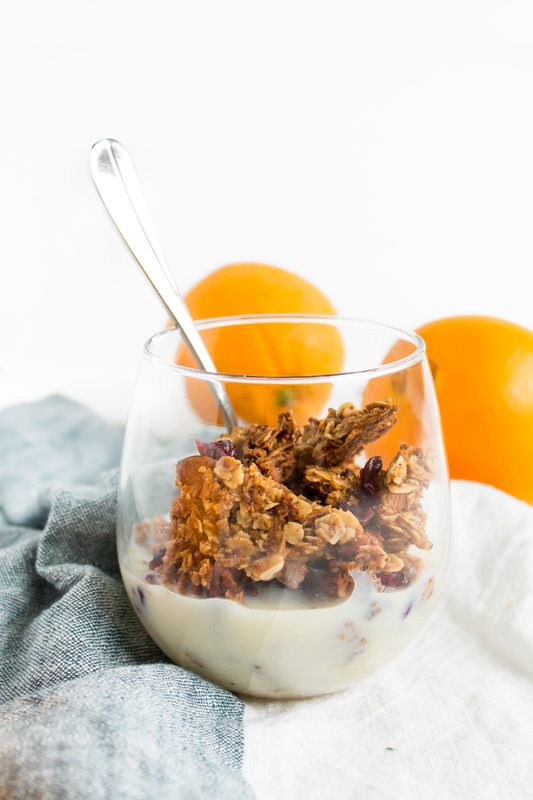 Oats, coconut, nuts, and dried fruit together add great variety of textures, and the almond extract and orange zest give it a great fresh citrusy flavor, with that familiar undertone of almond. 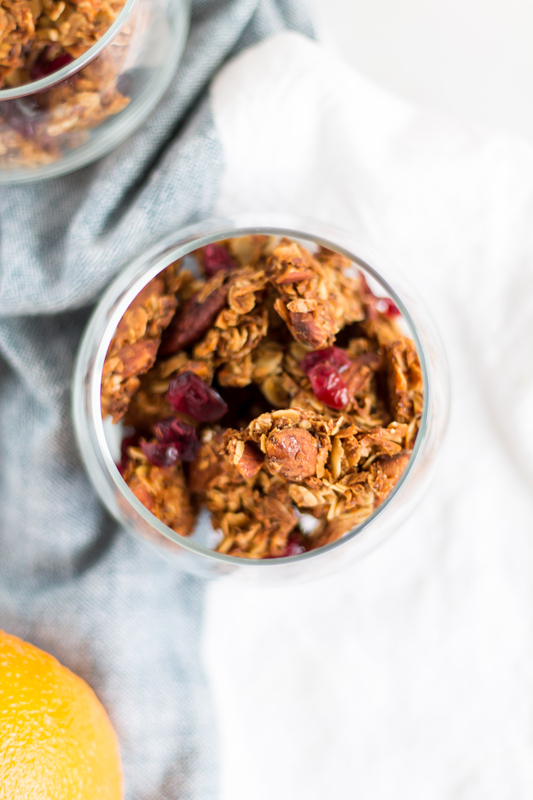 Honey binds all of the pieces together and makes the granola sweet without adding refined sugars. 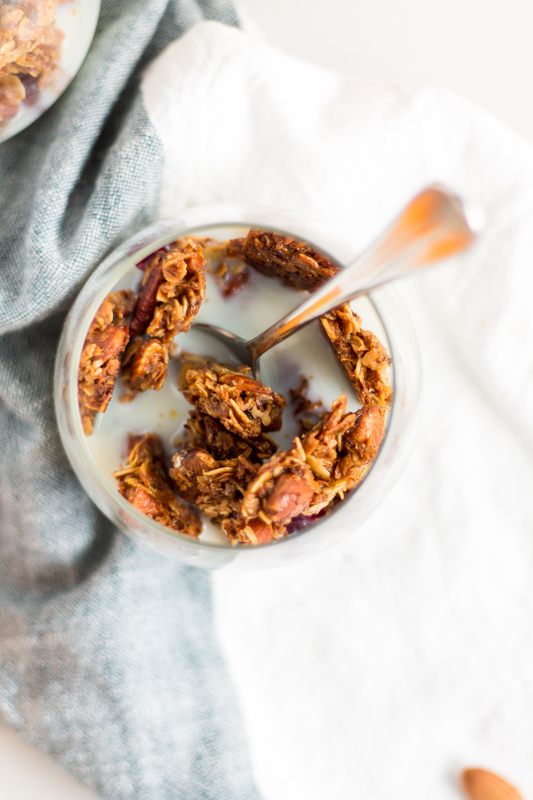 Baked until golden, the granola gets crunchy on the edges with a little chew in the middle, perfect when combined. It satisfies my sweet tooth in a way that I can feel better about than when I snag the extra cookie dough from the freezer. 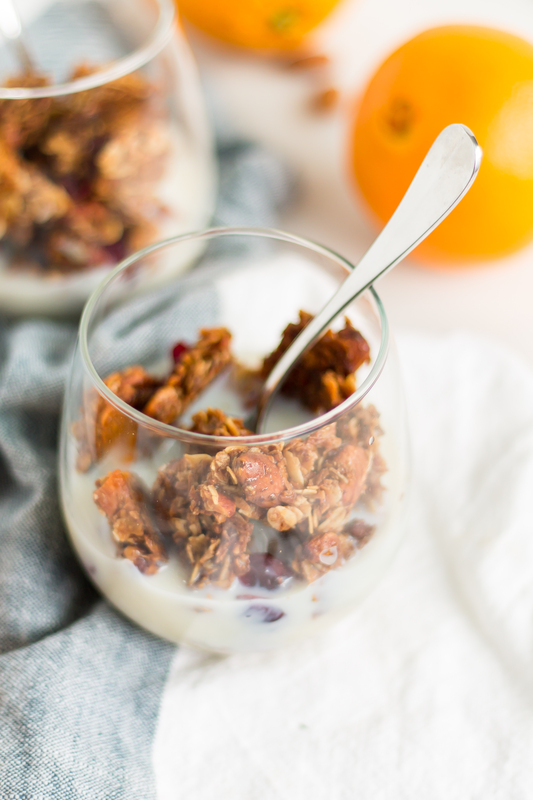 I often bring a small container of granola to work to snack on during the day, but also feel like it is such a treat when we have extra granola available for breakfast. My favorite way to enjoy homemade granola is with a bit of milk on top and a cup of tea on the side. It makes even a rushed morning feel a little more civilized and fancy. Preheat the oven to 350 degrees F. Cover a baking sheet with parchment paper. Spread the oats, nuts, and coconut evenly across the parchment-lined sheet. Toast for 5 minutes, then stir the ingredients and toast for 2-3 more minutes. Pour the toasted ingredients into a large bowl and add the milled flax seed, salt, and cinnamon. In a medium bowl, mix the olive oil, melted coconut oil, honey, almond extract, and orange zest until combined and the zest is evenly distributed. Pour the wet ingredients into the dry ingredients and mix until all of the dry ingredients are coated. 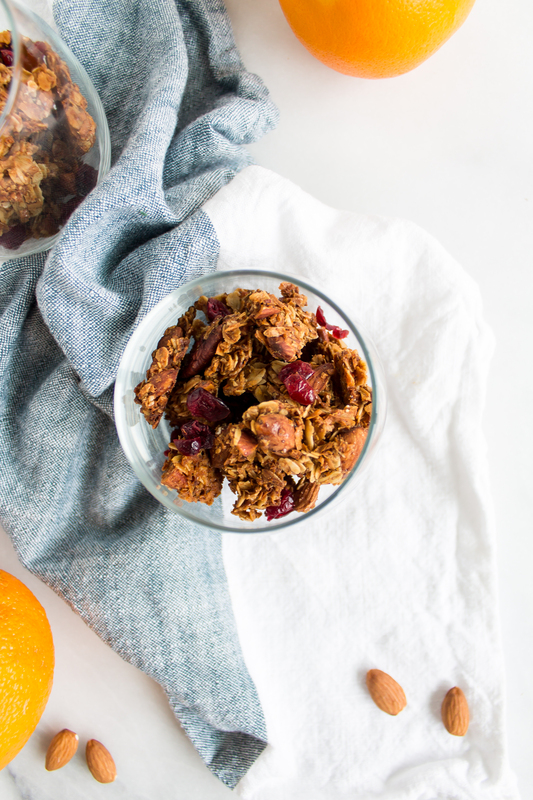 Evenly distribute your granola onto your parchment-lined baking sheet. Bake for 15 minutes, check the color and rotate the pan to keep cooking for 5-10 minutes. Remove the granola from the oven when it is golden, watching to make sure the edges don’t burn. Let it cool completely before stirring in the dried cranberries. 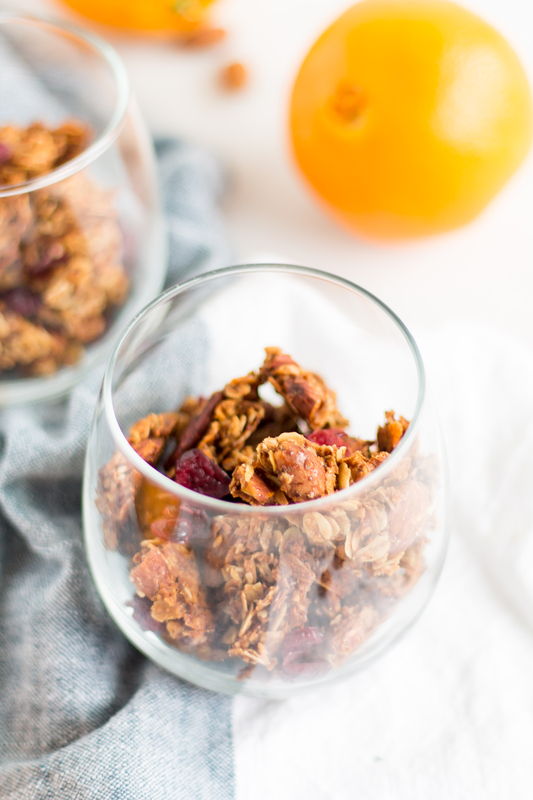 Store granola in an airtight container for 1-2 weeks.